It’s vital that we demonstrate to our leaders that there’s strong popular support for the abolition of nuclear weapons. One way to do this is to write letters to them. Below are some tips that will help you to become an effective letter writer. 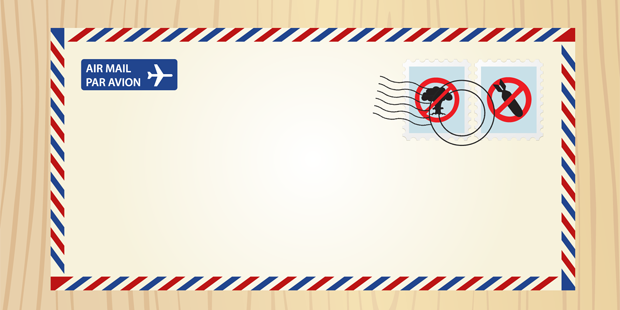 You may even wish to enclose a paper crane with your letter! Determine who you want to write to: You could write to your president or prime minister, an opposition figure, your mayor or your local member of parliament. It might also be worthwhile contacting non-elected officials, such as church leaders or academics. Find out about your leaders: It’s important that you know as much as possible about the leaders before drafting your letters. Have they ever said anything publicly about nuclear weapons? Based on their affiliation to a particular political party or organization, is it possible to predict some of their views? Work out what you want from them: You should have a particular request. Make sure that this can be realistically fulfilled by the leader you are writing to: e.g. don’t ask a local mayor to sign a treaty. Also, make sure your requests haven’t already been fulfilled: e.g. don’t ask South Africa to dismantle its nuclear weapons – it has already done this! Draft your letter: Your points should be clear, logical and well expressed. Don’t make the letter long if it doesn’t need to be, and be polite even if you strongly disagree with your leader’s views and actions. Below is a sample letter which you could tailor. Send your letter: You could send the letter in hard form or by email. Make sure it’s correctly addressed and, if it’s in hard form, be sure to sign it. Then await a reply. Leaders receive a large volume of correspondence, so you should be prepared to wait several months for a reply! I write to you because I am deeply concerned about the threat that nuclear weapons pose to our health, global security and human survival. Most countries do not want nuclear weapons because they threaten rather than enhance national security. They also divert funds from education and health care. I am a supporter of the International Campaign to Abolish Nuclear Weapons, which is calling on all nations to agree to a treaty banning nuclear weapons. The overwhelming majority of countries want such a treaty. We have already outlawed landmines, chemical weapons and biological weapons. It is now time to ban the worst weapons of all. I urge you to do everything in your power to support the campaign.